Let’s talk about our criminal justice system or more particularly our prison system. There are now – or will be soon – institutional reasons I can’t do this so I thought I’d give our current and future Ministers of Finance a virtual guest slot. I am shattered from that uniquely antip experience – economy class travel to the Mother country – so Ill leave it to them today. Tax treat at the end to keep you reading. Hon Bill from 2 min 50 til about 6 mins – the moral and fiscal failure speech. Focus on the content and not the delivery. (Future Hon) Grant speech to the Howard League. No youtube video I am afraid but you can hear the delivery even when reading it. Significant overlap with Hon Bill. Extra for those who kept reading! Now tax peeps if you have got this far here is the treat. 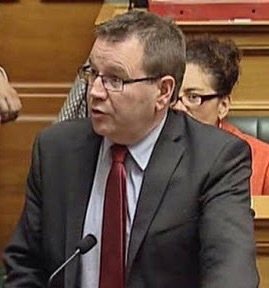 Grant Robertson on the bill that repealed cheque duty under urgency. I can only dream of such material with Budget 2017. First 4 mins are cheque duty but rest pretty good too. One final thing dear readers. While I am on my retirement cruise I am invoking the ‘except when there’s not’ condition in my Monday and Friday posting clause. Until late October I will only be posting on Fridays – except when I don’t. And talking about some things not changing, after the cheque duty valedictory, Robertson in this May 2014 clip was immediately back to the “housing crisis”. Yes I think that was in response to a removal of dumping duty from wall board or something. I think it was to reduce house costs by $3k all up. Again I can only dream of such material for any Budget 2017 post.